To correct a grade via the online process, first login to your MyOSU account. Once you are logged in, click on the Faculty/Advisors tab. 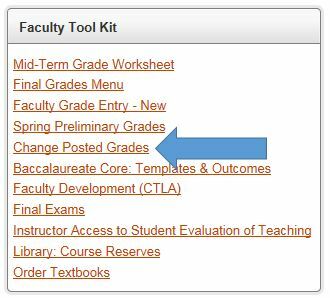 Under Faculty Tool Kit (see image below), click on the "Change Posted Grades" link. Select the Term in the pull-down menu, and click Submit. A pull-down menu will appear with all the courses you have access to. Select the Course from the pull-down menu, and click Submit. The class list will appear with all students for the term and their current grades. Note: Incomplete grades from previous terms will normally show as I/*. For example, I/F or I/N. Select the Student whose grade you need to change. Students are listed alphabetically in sets of 25 students per page. You can choose any set of students. If the student is near the bottom of the class list, select the group of students that includes the student you are looking for. Correct the Grade in the New Grade column. Review and Confirm the Grade Correction. You must do this for each grade that you change, or your changes will not be saved. Once you submit the grade correction, a confirmation page will display. If the grade is correct, click Submit again, and the change will be processed. If the change is not correct, select the correct grade and click Submit again. The confirmation page will re-display with the updated grade.